Currencies: GBP, MXN, PEN, HUF, HRK, NOK, SEK, AUD, CAD, CHF, USD, EUR, ZAR, CZK and others. Are you looking for the ultimate spin-themed online casino? Then you should definitely give Spinit.com a go. This online casino is the sister site of the world-famous CasinoCruise.com. You get to enjoy an incredible 1,200+ online casino games, with many more in the wings. There are at least 200+ mobile casino games for players, and they are available on iOS and Android-powered devices. The beauty of Spinit casino is the gaming platform. Proprietary technology ensures that players will get the most personalised bonuses and promotional offers possible. This is because the technology evaluates your choice of games, your wagers and your style of play and then conjures up an attractive package for you. Many online casinos feel that their game offerings are extensive, but compared to Spinit this is questionable. 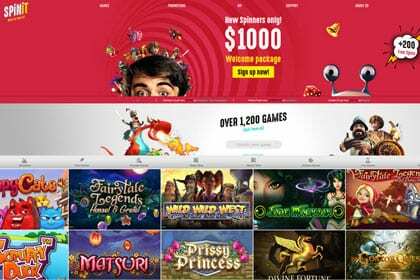 What’s great about Spinit is that there are some 1,200+ online casino games and they are provided courtesy of the world’s leading game developers. These include Net Entertainment, NYX, Evolution Gaming, Lucky Streak, Play’N Go and Microgaming. Players will enjoy all of the benefits provided by these developers, especially when it comes to progressive jackpots. The progressive jackpot games include some of the biggest money spinners in the world. For example, Cosmic Fortune, Treasure Nile, Major Millions, Mega Moolah, Wow Pot! and other jackpot games are rich with rewards. Many of the progressive jackpot games have been around for years, including Tunzamunni and Lots a Loot. You may have seen these games at other online casinos, but chances are you have never seen so many of them all in one place. Spinit is in a class of its own since it is primarily a slots casino. Hundreds of popular slots are available to players in a fun-play mode and a real-money mode. Except for the live games and progressive jackpots, all the other games can be played for fun or for real. This is a big bonus for players since it’s impossible to know which games are best suited to you if you don’t practice them first. This way, you get to preserve your bankroll for the video slots, classic slots, live games and jackpot games that you want to play. The live games are fantastic since they include all the hottest card and table games with real dealers. You can enjoy titles like Fiesta Roulette, Double Ball Roulette, Theme Park Roulette, French Roulette, Auto-Roulette VIP, Blackjack VIP, Baccarat Controlled Squeeze, Ultimate Texas Hold’em, and even Casino Hold’em. All in all, there are dozens of live games to play. Affordable minimums and lofty maximums are available on each of the games, making for a riveting experience. Make your first deposit and enjoy a 100% welcome bonus up to $200/€200/£200. Make your second deposit and enjoy a 50% bonus up to $200/€200/£200. Make your third deposit and enjoy a 25% bonus up to $300/€300/£300. Make your fourth deposit and enjoy a 25% bonus up to $300/€300/£300. The Spinner’s Choice – make a deposit and wait for the email that tells you about the game the week. This offer includes reload bonuses and free spins. Never Miss a Free Spin – with this promo reminder, you will always be in the loop about free spins and promotional offers. We Love Mondays… Soon you will Too! Put a smile on your dial, because Mondays are going to get a whole lot more fun with Spinit at your side. A fantastic reload bonus is available and it’s a great way to boost your bankroll with a 25% bonus up to $100. Many other South African online casinos offer you small bonuses in Rand, but Spinit.com offers EUR/USD/GBP bonuses which are worth so much more to South African players. This is really a great way to get the most bang for your buck. VIP players are in a unique category. The great thing about Spinit is that you get handsomely rewarded for doing what you enjoy – playing online casino games. The more you play, the bigger your bonuses. The name of the loyalty program is the Spinit VIP Plan. Unlike other operators that require you to amass all those points, Spinit keeps it really simple. All you have to do is play. The more time you spend playing and the more money you wager, the better your VIP offers. If you are wondering what types of VIP offers you are privy to, consider the following: cashback, special gifts and anniversary gifts, birthday bonus offers, weekend promos, exclusive bonus options and premium-grade customer support. How good is the quality of banking and customer support? You won’t have any problem with depositing into your account, since multiple payments processing options are covered. These include Visa, MasterCard, Neteller, Trustly, Skrill and others. The minimum deposit amount for most of these options is €10 and the minimum withdrawal amount is €20. Typically, you can expect withdrawals to be processed within 3-5 days. Spinit is terrific when it comes to customer support. There are 4 contact numbers for players, in Austria, Malta, Australia and Canada. Plus, there are several email addresses for general support, sending documents and complaints. Chat functionality is also available, courtesy of LiveChat. And if you need routine answers to questions, simply click on the FAQ section for more information. South African players will be excited about the quality of customer support. It is available in multiple languages and support agents can be reached between 8 AM and 10 PM GMT, from Monday through Sunday. If you prefer the callback option, that’s also a possibility, and mobile customer support options are available too.